This discussion was created from comments split from: Bulk Hops from Hopsdirect.com. Thanks lothos... I'll be building one of those soon. I'll probably use stainless steel screen mesh, so it's easy to clean and permanent. Ok, I give. What is a hop spider? scroll up. a hop spider is a simple tool that holds a hop bag. it keeps it from sinking towards the burners/heating element, while keeping the opening of the bag open for further additions. I saw the photo, so it just sits at the top of the boil the entire time? Cool. One issue I will have is brewing 5g bathes in my keggle. The wort is a long way from the top of the keggle. The hop bag would have to be huge or I will need to modify the way the bag hangs. Or just brew 10g batches. 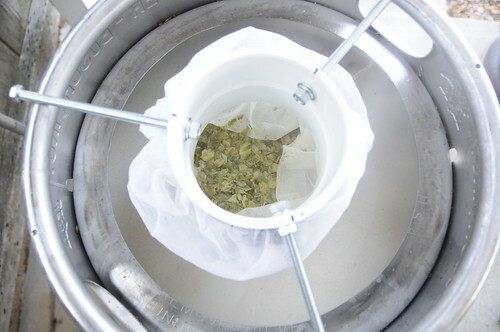 for my last brew I used a wire strainer and some wire. I just rested the handle on the side of the pot and adjusted the wire to hold the other end so that it was in the wort (adding a little length as it boiled down). It worked okay since I only use 1oz of pellets. Wouldn't work for the hop-head like Fry. I feel like a normal colander would work alright with whole cone hops, just add a wire hanger for each handle... I guess it wouldn't be as good as the spider posted... I'd like to have one of those... some day... some day... I want a lot of things. Can someone post a pic of one in use and or about to be in use, I'm still a little unsure of how this design is used. they make a spider for hops? i just use my regular spider from the kitchen to scoop them out. 3 or 4 scoops and pretty much all hops are taken out. Ok. so i'm getting ready to source some material on this... what size mesh would you think will work best. I want it large enough that the boiling wort will roll through the mesh freely, but fine enough to keep most of the hop particulate contained. i would think it would have to be pretty fine to keep pelletized hop material from getting out. there are a lot of different sizes... i'm looking for some guidance on roughly where on the standard sizing i should aim. 20x20, 40x40, higher? I have been thinking about building one of these as well. I'll see what I can find on the interwebs. awesome. i'm thinking a 16 mesh will be effective. it really helps to see the hand in the picture for reference. I was looking at the 14 too. I wonder of the 3x3 swath is enough? Clearly didn't look close enough. i thought it a 3'x3' sheet. Oh, and when you finish the design I would like to see. Can you post a file or email it? Yeah, I'll post it up here. I'm trying a few different shapes to get the most out of a 12x24. I may go up to 12x36. I'll post a few designs and show how the scale with a keggle. ok so this is a half baked, incomplete design, but i wanted to share a bit of where the design is at. im thinking just a couple of brass rod hangers to set the depth. I want to figure out an attachment scheme that allows it to be hung a different heights depending on the size of your boil. anyway, take a look, let me know what you think.